One in two marriages will end in divorce. These statistics become painfully real when the stats hit home. Dr. Tom Whiteman helps those whose lives have been shattered by the hurt and betrayal of divorce, shows them how to pick up the pieces of life, and offers strategies to cope with the changes and transitions they face. Divorce Recovery answers the most commonly asked questions. 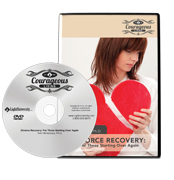 This heartfelt message is taught by an instructor who has personally experienced the grief and heartache of divorce and recovered!